Probably super bummed they weren’t the first to sign onto the groundbreaking campaign to block Cosmopolitan covers in grocery and drug stores around the U.S., Walmart has joined brands like Rite Aid, Hannaford and Food Lion in the fight against women photographed with text across their bodies. The National Center for Sexual Exploitation—not to be confused with the National Center for Science Education; actually, do confuse the two and check out the latter’s website—led by Victoria Hearst declared another victory this week, as Walmart reportedly said they would make sure to cover up Cosmo covers in their roughly 5,000 U.S. locations because they’re supposedly pornographic. The organization is also very pleased they can now tie their concern for the children who could potentially be looking at these magazines with the past career choices of a now 22-year-old woman. 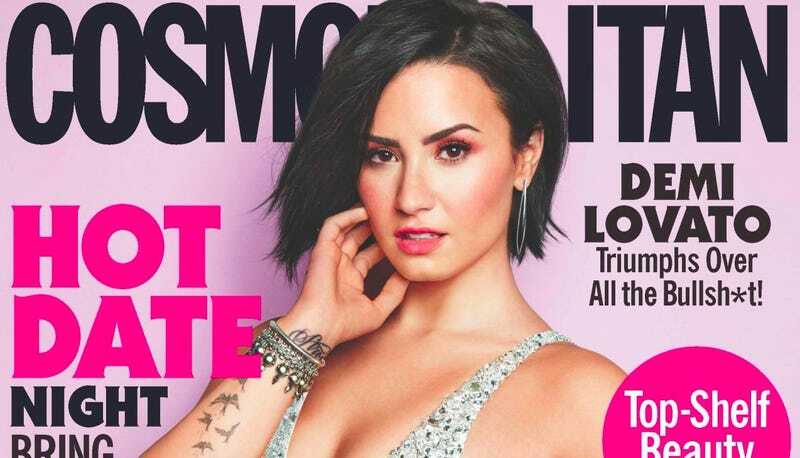 “Cosmo regularly targets young girls as evidenced by a hand-drawn picture by one of their 6th grade readers in the August issue and a Disney star on the cover of the upcoming September issue,” NSCE wrote on their website, referencing Demi Lovato’s presence as the magazine’s cover star in the latest issue. Unfortunately for them, Lovato’s not on team NCSE. Walmart previously had a policy to cover up Cosmopolitan in its stores but enforcement had become increasingly lax in recent years. The multinational retail corporation has now agreed to enforce that policy in its U.S. stores. This mimics reports from many Jezebel readers, who noted on my last post on NSCE’s campaign that the magazine is already covered up in a variety of stores in Southern and Midwestern states. Hearst and her team are deeply satisfied with their work, however, going as far as to take credit for a purported change in Cosmo’s coverlines. While the editor of Cosmopolitan said she is too busy to publicly debate our executive director, Dawn Hawkins, because she is “helping women have better orgasms” (her comments prove our point that this is a sexually explicit publication), it does seem that our efforts are affecting the editorial content of the magazine as well. The next issue has tamed down their headlines significantly.